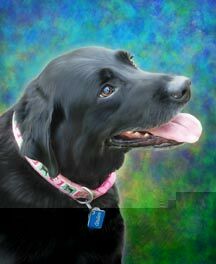 If you are confused by the headline above, here is what I use to create my pet portraits. I use a drawing tablet and special computer software to emulate real paint and real brush strokes. As a digital artist, many of the techniques I use are very much like those used by traditional artists, including the same hand motions as when using a traditional paintbrush on canvas. The only difference is that I use a stylus instead of a brush and my computer screen instead of a canvas. Visit here to read more about painting on computer. 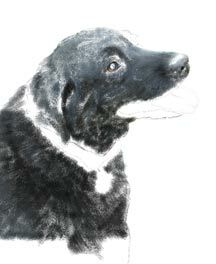 I've prepared a sequence of images to show the process I use in creating a pet portrait. 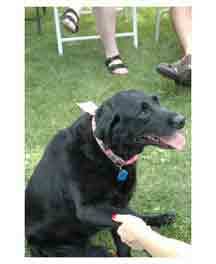 Here is the original photo I received of Cinder. As you can see, there is a great portrait here if only the background didn't get in the way. Most of the pet photos I receive, by the way, are very much like this one. Sometimes there just isn't enought time to get in close to capture the wonderful expression in your pet's face! Thankfully, this can be remedied with a little bit of patience and photoshop know-how. I begin by isolating the area that I will be working with. This means removing all the outside distractions and placing the image at the most appealing angle. Here, I have elevated the head slightly to give the impression that it is Cinder looking up instead of the person kneeling down. I felt it added more to her expression...creating a more loving look. 1) Get to know the exact shape I will be working with. 2) Clean up any stray image imperfections, colour balance, brightness and contrast. 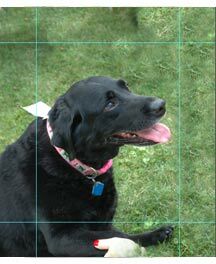 (You can see that I have removed the white tag attached to the top of her collar). 3) Give me the ability to more easily modify the background at any time in order to satisfy the decorative and personal tastes of my client. 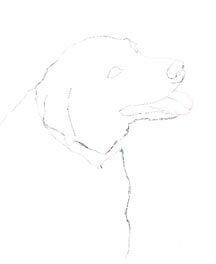 I then move on to another software program and begin to outline the image using a digital drawing tablet and special digital pen. 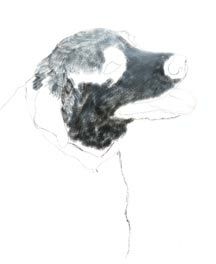 I can then make my brush strokes follow the outline cues that I've created. It is important to capture the flow of the fur. This is where I like to begin. There's a bit of playing around at this stage until the texture begins to happen. Once I have the right brush sizes and movement going, things begin to really develop. At this stage, I am constantly resizing my brushes to work out the finer details and playing with the density of the digital paint in order to create the 3D texture effect. 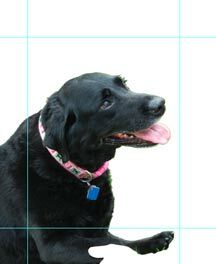 But first, I have to tackle the most important part of this pet portrait. After carefully painting the eyes, I go on to finish the rest of the body. When the main area is completed, I start to work on the other details like the collar and tag. In this case, I wrote in Cinder's name on the blue tag. It seemed the right thing to do and added that personalized touch. It's now time to add the finishing touches... After all, details details details...It makes a huge difference. 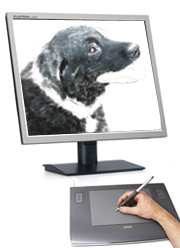 From highlights and shadows to whiskers and identifiable markings, everything is finely combed over until the pet portrait captures your pet's true likeness that is unmatched by simple photography. 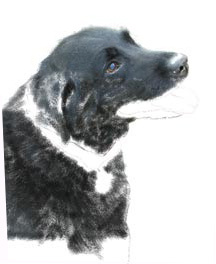 When you think about it, it is actually quite remarkable that we can take a so-so snapshot turn it into a work of art and totally delight pet owners with a heartwarming tribute of their pet. Is it any wonder, I so enjoy what I do? Diigital Painting - Gotta Love it!